One Mom's winey journey through life. Winey tasting notes, reviews and thoughts. I like a wine with a name that can make you do a double take - or a giggle. And I do have fun with wines that have somewhat naughty names. Ménage à Trois is one of them. In fact, the first time I tried it (You can read about it by clicking here) I couldn't believe that's what it was really called. But it was, and the red blend quickly became, and still remains, one of my favorite red wines (blends or not) ever. The whole "à Trois" thing refers to the fact that the winemakers like to blend their wines with three different varietals. And given the fact that I've been somewhat obsessed with all the rosé wines that are making it big this year, I was so happy to find out that there is a Ménage à Trois Rosé (2014, 13.5%, California). This particular blend of three is made up of 38% Merlot Blush, 36% Syrah Blush and 26% Gewürztraminer. It's a very pretty deep hot pink color, which is what first caught my eye. Since I'm such a big fan of this wine line, I grabbed it right away (no other wine patrons were injured or even pushed aside in the buying of this wine) in happy anticipation. The first aromas you'll get when you sniff this rosé is raspberry. Definitely raspberry! It's followed by a touch of strawberry and a whiff of that old Gewürztraminer stand-by, the lychee (or as I thought when I first sniffed it something I identified as "really ripe roses"). I tasted a wonderful array of summertime fruits and berries in this wine: strawberry, some tart gooseberry and raspberry. For good measure, there was a touch of honeysuckle flowers just lingering above all the other flavors. Given that just over a quarter of this wine is Gewürztraminer, it is on the sweeter side of the rosés I've been tasting recently. But please do NOT automatically think this means it's too sweet. The Merlot and the Syrah especially keep this from being classically sweet without sacrificing the lushness of the Gewürztraminer. The flavors are all crisp and bright and if you let it sit out a few minutes after taking it out of the fridge (or bring it to your sunny patio to warm up immediately), they really open up. If you like a crisp, refreshing wine that is full of fruit flavor but not fruity sweet, you will love this one. It runs around $10 a bottle and will be showing up in my wine fridge often over the next few months (I'm a sucker for rosé in the warmer weather). Go ahead and shake your head and say - wine in a box? Really? Yes really. 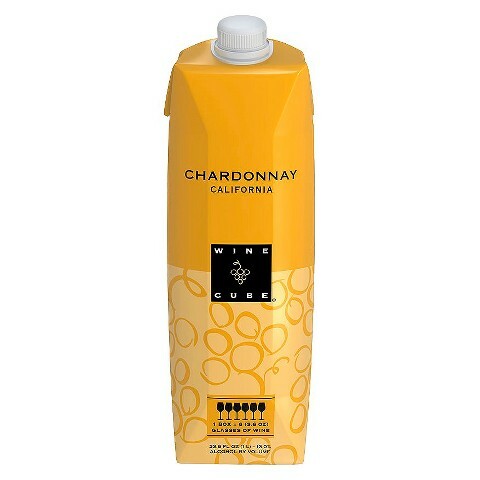 I have nothing against the container that my vino comes in, as long as the wine itself is good. And really, haven't we all been told not to judge a book by its cover? Same thing with wine. One fine day, as I was indulging in one of my frequent trips around Target, I got to the wine aisle. Yes, my Target sells wine. And beer. Yay me. (This was not always the case due to local liquor zoning laws, and I still celebrate the fact that they changed them.) I really did need to pick up some coffee, and happily, the coffee and the wine are in the same aisle. I have yet to figure out the deep meaning behind this, but I'm sure there is one. 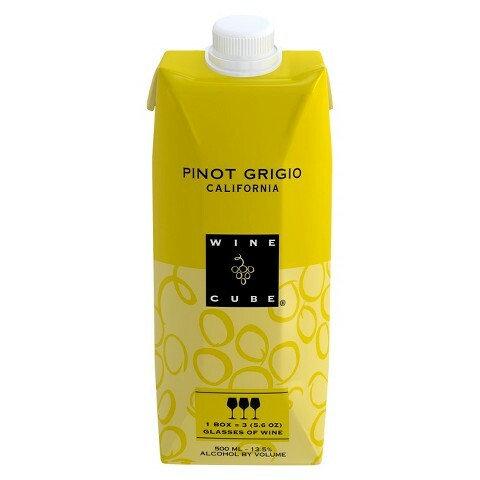 It dawned on me that the Wine Cube boxes were always right there as I entered the aisle and that it was high time that I tried them out. Summer was coming and I love the idea of a box for outdoor imbibing. The smaller cubes are just perfect for my sipping, since I am the only one at home right now who drinks wine on a regular basis. And they're the perfect size for trying too. At $5, the price is also perfectly right. Some background here: Wine Cube is made especially for Target by Trinchero Family Estates, which is parent to a ton of wines out on the market today. Target sells a whole range of different varietals, and so far I've tried three of them to review. The large boxes hold the equivalent of four bottles of wine, the one litres hold about 6 glasses and the small boxes (500 ml) hold three glasses. The box keeps them fresh longer and you will never ever have a cork taint problem! I started with the Chardonnay, (NV, 13%, California). The nose was cinnamon cream and pear. It tasted like mellow golden apples and finished with the taste of a pear tart and some light oak. A wonderfully flavorful, solid Chardonnay. I will buy this one again. You'll like it if you like your Chardonnay to taste like autumn with a creamy mouthfeel. 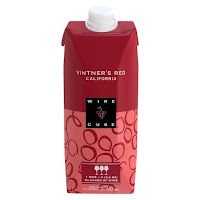 Next up was the Vintner's Red (NV, 13.5%, California). This is a blend of Zinfandel, Merlot and Cabernet Sauvignon - three of my favorites and all in a red blend, which I love. This wine had a nose of cherries. The flavors were all chocolate and cherry. It felt smooth and silky and supple. Another winner here. You'll like this one if, like me, you are always in need of that chocolatey/mocha flavor in your reds. If you like a smooth red, without big tannins, buy yourself a box. And them I moved on to the Pinot Grigio (NV, 13.5%, California). Aromas of lime hit me first followed by flavors of peach and citrus rind. It finished off with the taste of apricots. This is not a "bitey" Pinot Grigio - no sharp tartness and puckery citrus. You'll like this wine if you like your Pinot Grigio cold and crisp and fruity - but not sweet. After thoroughly enjoying my first foray into the Wine Cubes, I will plan on trying out some of the other varietals. There's a Pinot Noir and a Sauvignon Blanc and a Cabernet Sauvignon that I have my boxy little eyes on. And since I seem to be physically unable to go through a week without visiting Target, I figure I'll be trying them pretty soon. Let me know if you try them....and.......Cheers! Well I found another one recently. It's been on my winey radar for a while, but I have just never tried it. But I reached for it one day and I am so very happy that I did. 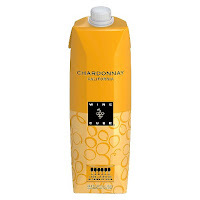 The wine in question is Bogle Chardonnay (2013, 13.5%, CA). I've had some of their other wines, their Essential Red is quite yummy. So I should not have been surprised that the Chardonnay was equally as good. But still, I didn't know it would make it onto my Favorite List! But make the list it did. Why? The nose is full of pears and yellow apples. Those were also the first flavors that showed up when I sipped it. Added into these were cinnamon and nutmeg. At the end was a kick of tangy oak. This was was so mellow in the mouth. Round and full and flavorful. The second time I tried it, I found that nothing had changed. I liked it more and more. And it slowly dawned on me that I'd found another go-to wine. Not just because it was very, very good (direct quote from my wine journal, by the way), but also because I could see it going nicely with a whole lot of different foods. Pork, lamb, chicken, seafood - it would work with them all. I also used it to make my rosemary-herbed pork chops with wine shallot sauce (OK, so it's my recipe because it's on my Pinterest board...but I did make it) and oh my, was it ever tasty. 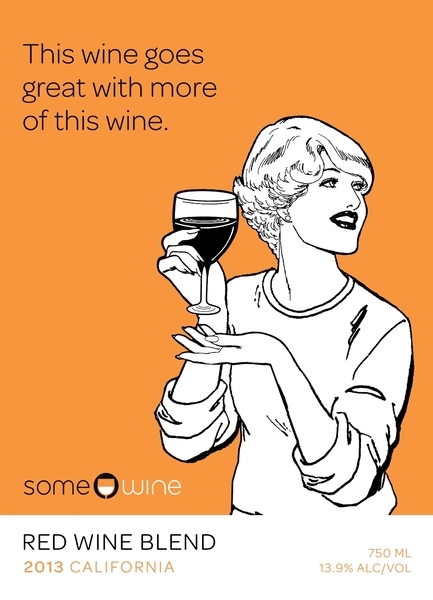 I love to use a wine in a recipe and then sip it as well. It's such a full circle type of feeling, you know? If you like your Chardonnay full of mellow fruit and pie seasoning flavors, oaky, but not overly oaky, you will love this wine. And if we are ever out to dinner together and I get asked to pick a white wine, it's a pretty good shot that it'll be this one! If you even think about sipping on wine, I am sure you have seen these new offerings from SomeWine. You can't miss them, because their labels are designed by the the very funny folks at Someecards - the ones we all pin and share on Pinterest. 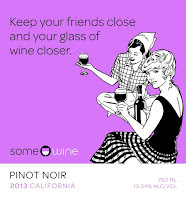 And send to our other Winey Friends on Facebook. At first sighting, I grabbed a bottle. Because I do that. I am not above buying a wine for the label and this was a no-brainer for me. 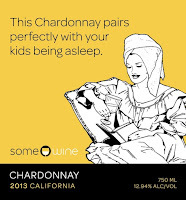 The only thing that made me hesitate for a nanosecond was the fact that I saw the Chardonnay first, and the label didn't TRULY apply to me, The Winey Hubby and I being empty-nesters and all. But then I remembered that we have two dogs under the age of 3 and I gave up on the thought of hesitating. 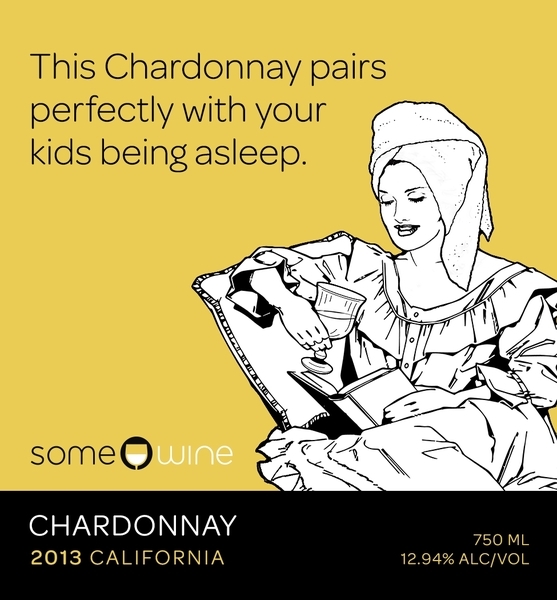 So let's talk about the SomeWine Chardonnay (2013, 13.2%, CA) first, shall we? It has a nose that's full of yellow apples and honeysuckle. The taste is creamy and smooth and starts off with a flavor of light-colored oak, a thin line of honey in the middle and ends up with some mellow caramel. It finishes off with vanilla cream and caramel. Can you just feel all that smoothness and rich flavor in your mouth right now? Good. Because this was such a yummy, classic Chardonnay. It retailed for $12 in my area of Ohio. If you like your Chardonnay oaky and creamy, this is one for you. Moving on (to a different store actually - I kind of feel like these wines were following me around just begging to be purchased) to the Red Blend (2012, 13.1%, CA). Once again, I chose it for the label. Because who doesn't want to pair wine with more wine? (If you answer, "Me" to that question I would seriously rethink your pairing priorities.) The cost was the same (this IS Ohio after all and there are no bargains to be had on wine...) The nose starts with mocha java - chocolate and coffee - one of my favorite aromas. You'll taste flavors of coffee, thyme, cassis and a hint of cherry syrup. I must warn you to let this breathe first - if you don't you'll get an annoying tinge of spearmint to the flavors, and although I have nothing against spearmint in and of itself, it does not fit in with the other flavors. So, a little air, and you have a pretty darn good red blend, especially given the cool label. If you like your reds herby and full, grab this label, er, bottle. 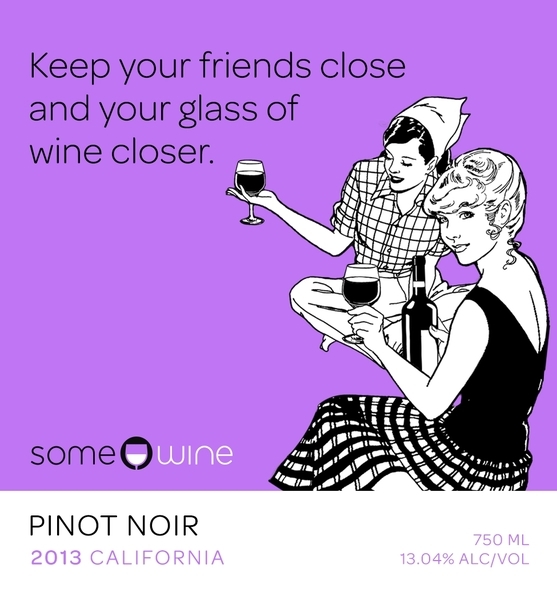 The other varietal in this series is the Pinot Noir, and I can promise you I'll be trying that one. The wines are actually produced by the 1026 Beverage Company, two buddies with a long history in the wine-making industry, so they know what they're doing. Especially when it comes to those labels. Barrels are a big deal when it comes to wine. New oak, old oak, French oak, American oak: they all bring something different to the vino. But I recently got to taste some wine that had been barrel aged, not in wine barrels, but in Bourbon Whiskey barrels. Huh? I will admit to knowing very little about Bourbon, or whiskey, be it Bourbon (American) or Irish, or Scotch or whatever. And as I admit that I can hear my Irish grandfather rolling his eyes at me in heaven. (This was man who introduced a cousin and I to whiskey sours way back when. We were 11. Ahem.) Anyway, it remains that I don't have much knowledge when it comes to whiskey. Leave it to Robert Mondavi wines to come up with this. They start with their California grapes, which make some amazing wine on their own. In this case, the grapes are 85% Cabernet Sauvignon, 10% Malbec and 5% Petit Verdot. Then some of the wine is aged in Bourbon Whiskey barrels for three months. A Bourbon Whiskey barrel, by whiskey law, must be oak and charred inside. The result is Robert Mondavi's Bourbon Barrel-Aged Cabernet Sauvignon (2014, 14.5%, CA). I got my first taste of this wine at a little tasting bar and was pretty much wowed by it. Cabernet Sauvignon was my first red wine love, and it's always to fun to find one that's so good. This wine is deep, dark garnet color. It starts with a nose of cherry - some red but mostly dark, black cherry, mocha and oak. The flavors are big: blackberry and lots and lots of caramel (yum). The flavors are all wrapped up in some toasty oak. The finish is lush and smooth and very well balanced. I immediately bought two bottle of this and plan on buying more. But I (and you) will have to buy it quickly, as it's a limited release. The guy who was serving at the tasting warned us about this, which I think was very nice of him. It runs around $13 a bottle and would pair so nicely with steak or pork or Bourbon chicken (I had to throw that one in). Buy a few - if you like your wines big and bold and toasty and silky you won't regret it! During the summer of 2014, The Winey Family took a trip to Italy. We were celebrating the graduations of both Winey Children - one from college, one from high school. We'd always wanted to go to Italy, so we took off for an amazing 11 days in Rome, Florence, Cinque Terre and Venice. It ranks as one of our all time favorite trips and we love to reminisce about it. It was a glorious time - from the culture to the history to the sunny, hot weather. And of course, I found some wines to write about: The Wines of Cinque Terre, When in Rome....Drink Frascati, Pinot Grigio in Rome..at Target, Spritzing like they do in Italy. One variety of wines I didn't write about then were the Italian Rosé wines, which I absolutely loved. I had tried different Rosés before, some French, some US, and some Italian and I liked some, others, not so much. But the Rosés I found there were wonderful! And for the most part, they were anonymous house wines or local wines that could not be found back here in the US of A. And believe me, I tried. But I just couldn't find one that brought me back to our time there, most notably to a very special canal-side dinner in Venice. It was there that I had one of my favorite Rosés of the whole trip. But I never got the name (it was a house wine and there wasn't a whole lot of English-Italian communicating going on - on both sides!). I never really gave up looking, it was always in the back of my mind that I could find a Rosé like the ones I sipped on our trip. One day, in the grocery store, I decided to buy a bottle of an Italian Rosé that I had seen many times. It was only $8 and had been hanging around the store for quite a while. I had passed it by because, well, I don't really know why. I just did. Time and time again. It just didn't seem to be one I'd like. The wine is question is Piccini's Memoro Italia Vino Rosato (NV, 13.5%, Chianti, Italy). It's a blend of 40% Negroamaro, 30% Montepulciano, 20% Nero d’Avola and 10% Merlot del Veneto. I will never know why I decided to buy it that fateful day.....but oh my, I am so glad I did. Because this was the one that brought me right back to Italy! The Rosé I had been searching for, and I found it about a mile away in my grocery store, no less. First of all this wine is so pretty: a lovely medium-deep pink translucent color. The nose was faint raspberry. The first taste was sharp strawberries followed by raspberry and then a line of cranberry. The flavors were crisp and clean without any citrus, so I would call this a juicy, full flavored dry wine. No citrus here, like you'd find in a Sauvignon Blanc...this was pure Rosé - from those red grapes! This wine was just wonderful: crisp and refreshing and light all at the same time. I know it would be a great wine to pair with food when summer arrives, but I absolutely loved it all on its own in the middle of an Ohio winter. "Memoro Italia," according to the back label of the wine, is Latin for "remember Italy." And let me tell you, this wine lives up to its Latin. It made me remember our time in Italy in the best of ways! And it's a time that I'll always cherish: full of family, fun, travel and love. A few weeks ago I reviewed an Israeli wine in honor of our recent trip to Israel. That was a white wine. (Winey Tasting Notes: Revisiting an amazing trip with Israel's Mediterranean Soul wine.) Today, we're going to go red as I reminisce about that wonderful, wonderful trip. The red in question, Mediterranean Soul's Red Blend, comes from the Golan Heights sub-region in the Galilee region of Israel. (You can read more about the regions in the first post.) I thought that Galilee was such a pretty part of Israel and thoroughly loved our time there. But we were on the move, and after a few days in Galilee, we headed out to Jerusalem. Talk about an amazing city. If you stand on one of the scenic overlooks to gaze at Jerusalem, it's like looking back in time...and yet not. You look at old Jerusalem and the walls and the domes and its all-white stone. And then you see the newer buildings, which are required to be built in the same stone as the old ones, which makes the city so seamless and sort of anciently ageless. The city embraces its past and the huge cultural and religious significance of the city, but it doesn't block any forward progress. My favorite part of Jerusalem? 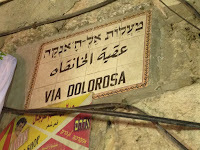 Old Jerusalem. You actually have to walk through stone gates to enter into the old city. 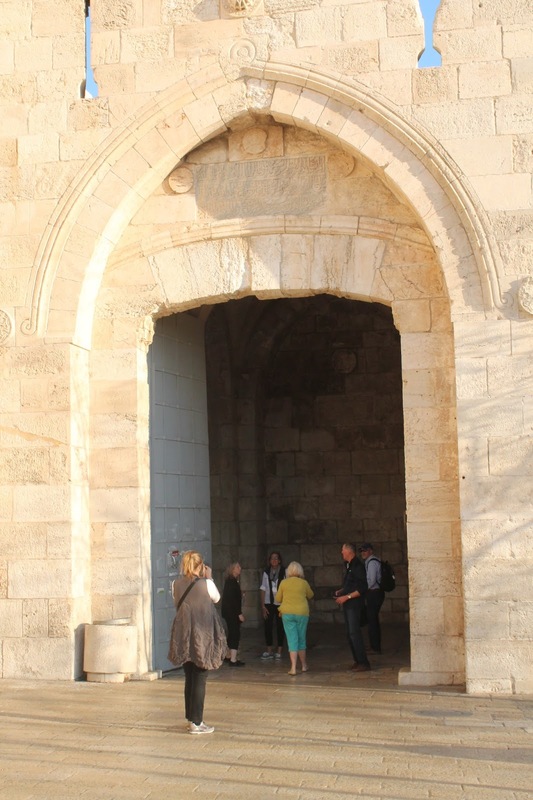 On our first foray, we went through the Jaffa Gate, which borders on the Armenian and Jewish sectors of old Jerusalem. You walk through and boom! Narrow cobblestone streets that wind in and out and around. Merchants teeming on each side of each street. The smells of different cuisines, herbs, coffee and leather. The chatter of shoppers as they go their way. Sure, the goods being offered now are a lot different from the things they sold hundreds and thousands of years ago, but you totally feel as if you have stepped back in time. We walked and shopped and eventually wound up at the Church of the Holy Sepulchre, where hundreds of pilgrims head daily to visit one of the spots claimed to be Golgotha, where Jesus was crucified and buried nearby. 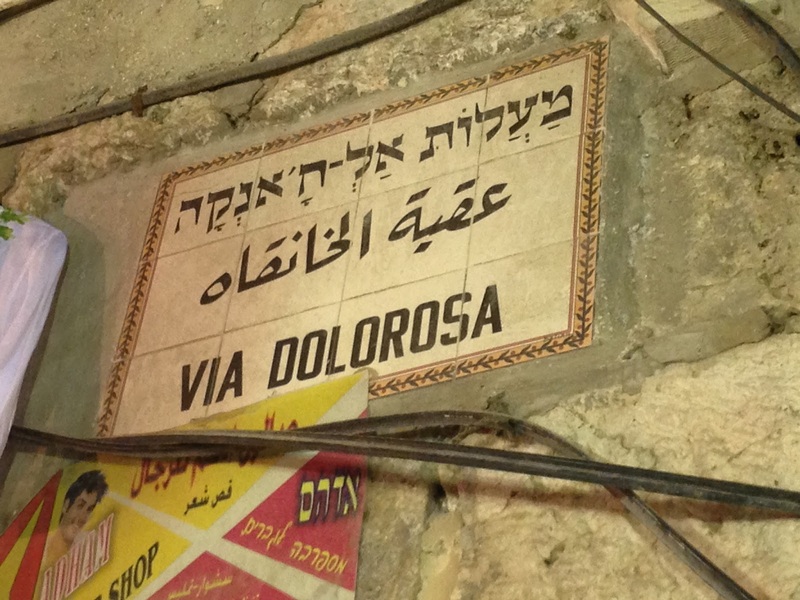 Outside the church, you're walking the Via Dolorosa, the route that Jesus took to his crucifixion. You can't help but walk it, because two thousand years later, it's still part of the city, just as it was back then. The sheer history of Jerusalem astounded us time and time again. After our wonderful time there, I was very excited to find the Mediterranean Soul line of Israeli wines when we returned to the USA. Every time I sip them, I'm reminded of that amazing trip. Mediterranean Soul is a boutique winery in the Golan Heights. As I said, I had tried a white blend first, but this was a red blend: Life Red Blend (2013, 13.9%, Golan Hts, Israel). It's a blend of Cabernet Sauvignon, Merlot, Cabernet Franc, Malbec and Petit Verdot. You'll get raspberry and fresh herbs on the nose. You'll taste fresh, green herbs and end with a tiny hint of coffee. The tannins on this wine are very present and they end up with a hint of cherry in your mouth. This is a smooth wine, but not velvety smooth. It's smoothness doesn't come from the fruit flavors that you usually find a velvet feel with...this time it's more of an herbal smooth. You'll love this wine if you like a full on red wine without any hints of fruit to speak of and more of a green, garden-y taste. These wines are very affordable (about $10 a bottle) and I found them locally here in Ohio, so I hope that you can find them as well, wherever you are. I am really enjoying them...almost as much as I am enjoying reminiscing about our trip. Love wine, hate wHine! Writing about the wines we see in our everyday travels through life...nothing pretentious, just one mom's winey little opinions! Mom to one boy, one girl, two dogs and one husband. Northwestern Univ. grad, Alpha Phi, West Point and Army mom, bookworm. Cheers! © 2011-12 The Winey Mom All Rights Reserved. Simple theme. Theme images by funstickers. Powered by Blogger.